Ditch Dieting, and Detox to Feel Better than You Did 20 Years Ago! 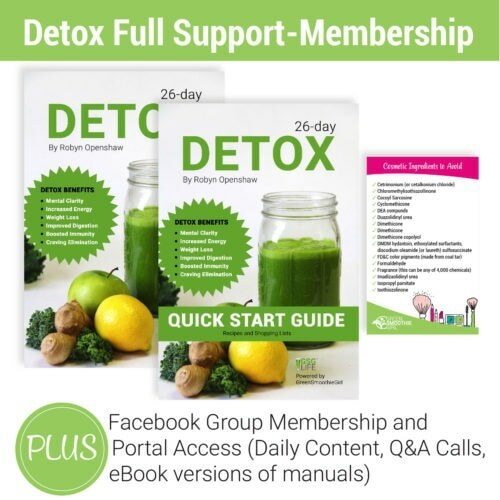 The Full-Support Detox is Available with Huge Bonuses for a Short Time Only! Lifetime Memberships include BONUS PACKAGE worth $223! Get 40% Off Detox During the Early Bird Phase! Most of us are in a state so undesirable—but so common—that we’ve accepted it as normal. You’re tired all the time, and you’re way too young to be so tired. Your weight is over your ideal, and trying every fad diet hasn’t worked. Your digestion isn’t really working, but you don’t know how to fix it. You often feel depressed, anxious, or overwhelmed by everyday life problems. 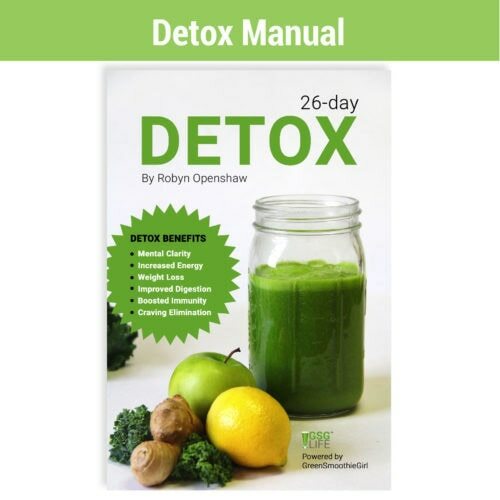 Robyn Openshaw, detoxification researcher, author, and your guide. What if these conditions weren’t necessary and were easier than you thought to turn around? Toxic sludge has built up in your digestive tract, and chemicals have accumulated in your liver, kidneys, skin, and lymphatic system. Your blood is circulating toxic fragments round and round. What if there’s a way out? The GreenSmoothieGirl Detox is 26 days of the most productive rest-and-repair you’ve likely given your body in an entire lifetime and we support a detox only a few times each year. Take the journey and you’ll get detailed instructions (videos, manual, and quick start guide). You’ll get support from experts and other detoxers. Best of all, you’ll get recipes that taste good, and you can eat as much as you want! 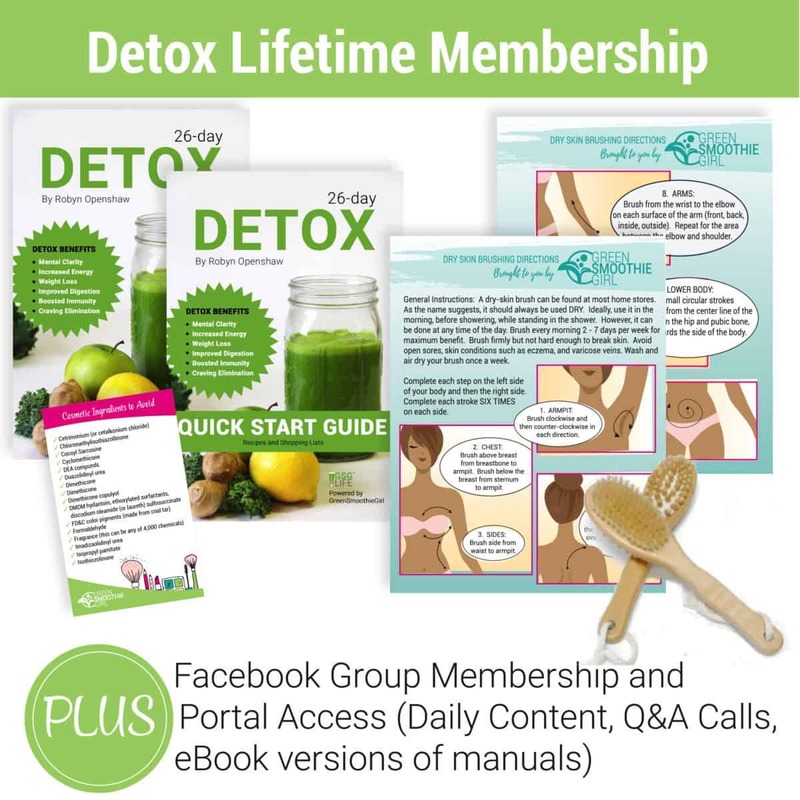 This program is based on good science and extensive research on safe, effective detoxification. Right now, we are offering a HUGE BONUS PACKAGE because we want you to join us for an exciting health journey together! Detoxify your colon, liver, kidneys, gallbladder, blood, and lymph in just 26 days! Lose weight (if needed) and reduce your "weight set point" so your body isn't hoarding fat reserves! Learn important techniques to optimize your detox, from world-renowned experts. Watch symptoms melt away, in just days, as you reduce metabolic burden and the body focuses on elimination. Enjoy the camaraderie, tips, and photos of hundreds of your peers, detoxing with you, plus our experienced Detoxinistas, supporting 7 days a week! Meal Prep, shopping lists, menu plans, and daily tips are all laid out for you! Join us Level 1 if it's your first time, or Level 2 if you're up for a challenge! Discover your food sensitivities, as you add back in one food group at a time. Discover connections between your food, and your symptoms, you couldn't otherwise find. 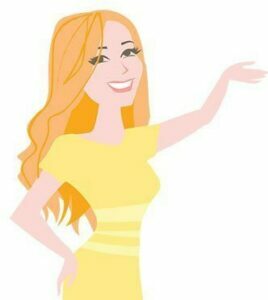 Bring your questions to several Monday-night Q&A calls with Robyn! Learn how to minimize future exposure to toxins in food and environment. Much more than a diet or menu plan, learn easy practices to optimize elimination to reverse aging and reset your health! Find a "buddy" if you don't bring your own, in our thriving community, and enjoy having an accountability partner for maximum chance of success! Lifetime Full Support Membership gives you a $223 BONUS package, ending soon! So, what's in the bonus package? 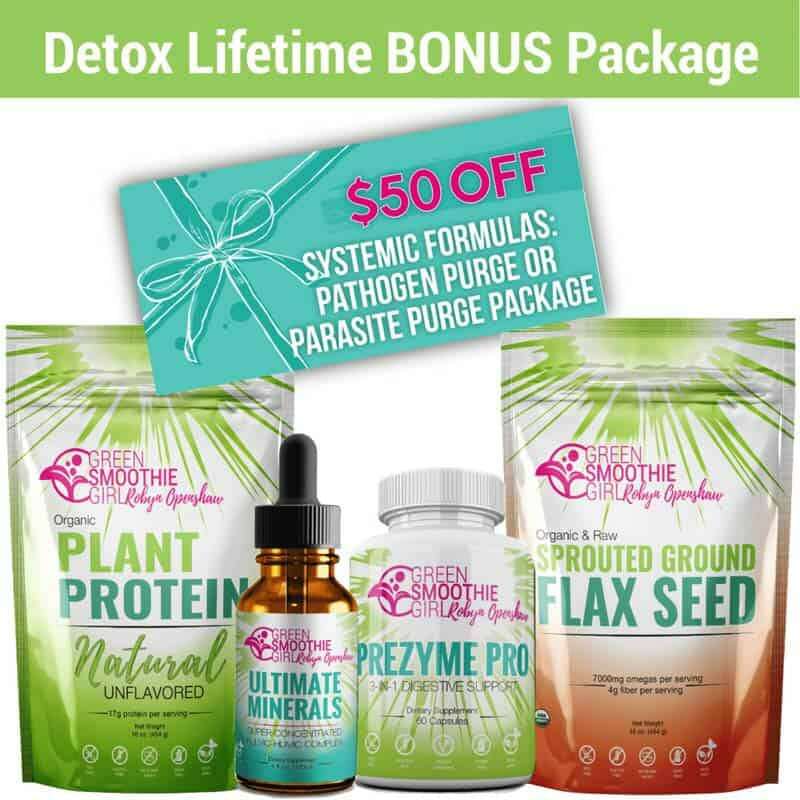 $50 off coupon for a Systemic Formulas Pathogen Purge or Parasite Purge supplement package. * Bonus & included items are offered at initial purchase and may not be available for future upgrades. Results will vary. Average weight loss is 12.5 pounds, though the range is 5 to 27 pounds in the 26-day program. If you wish to avoid weight loss, follow instructions in the Detox FAQ. Please do not undertake any diet or exercise regimen without consulting your trusted healthcare provider. Not in the USA? Click here! 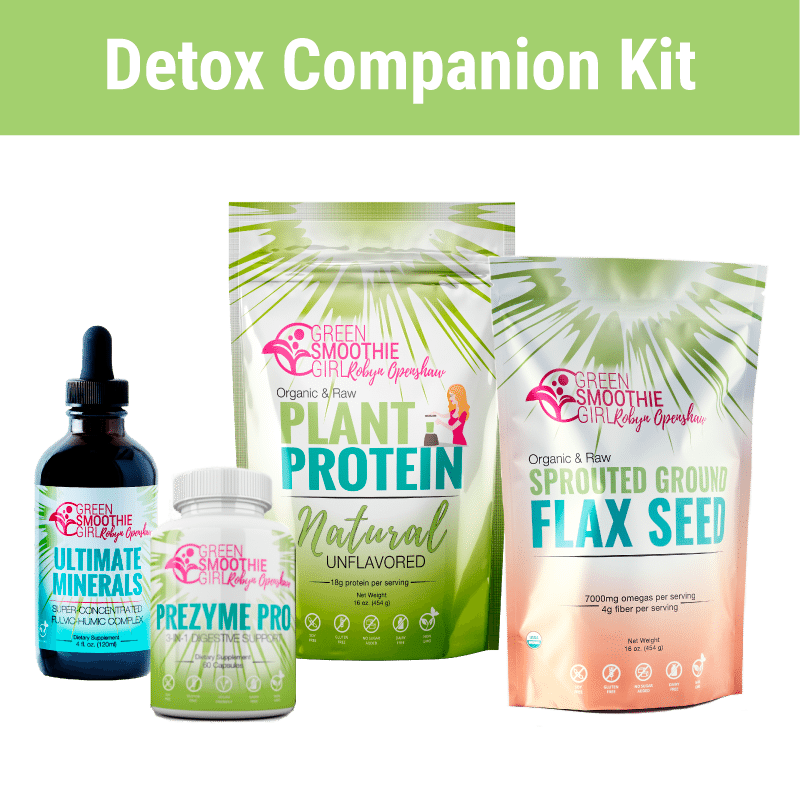 Get 20% Off The Detox Companion Kit! Plant-Based Protein: Clean, organic protein and prebiotics for energy, satiety and muscle support. Sprouted Ground Flax: Essential Omega 3s for heart, brain, and mood stability. Ultimate Minerals: Supports every bodily system while it binds to and safely eliminates heavy metals! PreZymePro: 3-in-1 digestive aid with plant-based probiotics, prebiotic, and enzymes. The best thing I’ve ever done for my health, cholesterol down, and 11.5 pounds lost! The Green Smoothie Girl Detox has got to be the best thing I have ever done for my health. I lost 11.5 pounds and my cholesterol dropped 62 points from 230 to 168. I had my blood work done just before the detox started and again on Day 26. My doctor was thoroughly amazed at the changes in my numbers. There were three things that made the detox much easier than expected, thanks to FULL SUPPORT. One, my buddy: I could not have done it without her! We constantly bantered with each other: “That salad would have been really good…if it had salt, HAHA!” Two, the daily content. The information in emails, videos, calls, and audios was invaluable. Three, the forum. If I ever had a question, I would post it on the forum and it was answered very quickly. It was also nice to read postings from other participants. Nice to know others were experiencing the same things I was going through! I absolutely recommend the detox to anyone that wants to change the way they think of food, remove food cravings, lose weight, have more energy and an overall sense of wellness. It was a wonderful experience. I have many family members asking how they can be part of the next one. They are amazed at the changes I have made. Life Altering and 11 lbs. Lost! My daughter was my buddy and encouraged me every step of the way, ate the food with me and constantly reminded me of how healthy I looked—-my skin, weight loss, increased stamina, and positive attitude. My granddaughters (1 and 4) loved the green and hot pink smoothies, the lentil soup and quinoa salad. Even got my active duty Army Apache pilot son-in-law to begin the green smoothie lifestyle! My goal doing Detox was for better health. I feel like doing Detox was the best thing I’ve ever done for my body. I lost 11 pounds which is nice and a good thing but more importantly I want my organs to be 100% healthy. Detox helped me understand what an amazing machine God gave me. I want to honor Him by taking care of His gift! Excellent, excellent program. Just can’t thank you enough for the life-altering information and work you are sharing with us. My husband was my detox buddy for this (our first) 26 day detox. I shopped & he helped with the food prep. We both had detox cleansing symptoms of headache, fatigue, achy joints, gas & bloating which lasted at least a week into the program. For years my husband has been on blood pressure meds (even on the meds his BP was 150/96). After the first week, he was still feeling very tired and weak. He was hydrated, resting as needed, eating plenty, taking lots of cinnamon. When he took his BP it was 103/57! The doc took him off all meds after that first week of detox. He donated blood at the end of our detox. His iron level rocked (proves no need for red meat!) and BP 120/72!!! We were surprised that we were never hungry and generally had no cravings. Having no salt was the hardest to adjust to (harder than no caffeine). We did the skin brushing, oil pulling, infrared sauna, exercises. While we read a lot about the coffee enemas, we did not try them this first detox. I really appreciated the shopping lists & menu plans which totally simplified the detox. Also, the daily emails & video supports were very beneficial to keep us understanding the process, as well as promote motivation to persevere. In addition, he dropped a total of 22 lbs while I dropped 11 lbs. We feel great with improved energy and the desire to continue a cleaner lifestyle in all aspects of our life. We have been walking testimonials as others have observed the positive changes in us, both physically as well as mentally/emotionally. We would do this detox again. Healthier, More Energy—and 15 Pounds Lost! 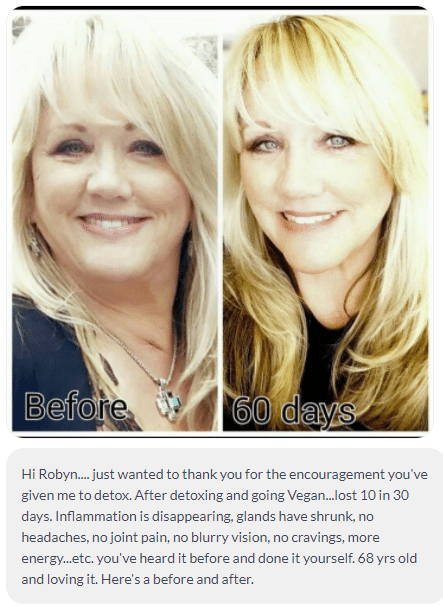 I would like to thank Robyn so very much, (as well as all the support doctors, friends and helpers), for this wonderful detox program you offer. It is very well organized and you made it so easy to follow. I also would like to especially thank my good buddies who helped me to make it through with their love and encouragement. It was also a big help to read the forum of what all the other participants were going through and the response answers that were given. I started the program at being 40 pounds overweight and I am happy to report that I lost 15 pounds! Because of the cleanse, I feel so much healthier and have much more energy! During the detox, I stopped taking all my vitamins, supplements and my prescription medications for acid reflux and cholesterol. I continued to take my Synthroid since I had my thyroid removed this past February. But I’m happy to report that I had my blood work levels checked in the middle of the detox (2nd week in) and my doctor said he could lower my level of Synthroid, and the cleanse and my weight loss were probably the contributing factors! This is the jump start I needed to tackle my goal of losing the remaining 25 pounds I need to lose! I plan to continue to use many of your great recipes, your exercise tips, portion control and reading all labels when shopping to make healthy food choices! Thanks so very much again! Skeptical Registered Nurse Learns about Nutrition and Loses 15 lbs! The journey that I took in participating in the GreenSmoothieGirl Detox has been life changing. I don’t use that phrase lightly, as by nature I’m pretty skeptical, so please understand how big that is for me! I never thought I could live for 26 days without meat and chocolate every day! It is amazing to me how my taste buds have changed and how I no longer crave the foods that I once did. It was difficult at times, but having the online support and my detox buddy helped me through that. I am a Registered Nurse and always thought I understood nutrition, but now I realize how far off some of my thinking has been. I am so appreciative to Robyn and her team for creating such a great program and for opening my eyes to the way that I can now live. I lost 15 pounds! Setting Personal Records in Triathlons at Age 49, Down 9 Lbs, and Feeling Phenomenal! I FEEL ABSOLUTELY PHENOMENAL!! Official stats during the 26-day GSG Detox period: 9 pound loss (8.5 lbs. fat loss, 1 lb. fluid loss, and gain of .5 lb. lean muscle)! I have been a Green Smoothie Girl since May 2012, and now my life has just become nutritionally stronger. Competing in triathlons for 7 years, I am now setting new personal records at those events at the age of 49. My taste buds have been altered and I can now pass up that bag of chips (my downfall was salt)! I’ve discovered the benefits of being healthy at the cellular level. Now with the Detox, the cells are that much more cleaned out. Full support and with a buddy is VERY HELPFUL for success! Thank you, Robyn! GSG Detox Is One of the Most Powerful Things I Have Ever Done for My Health! The GSG Detox is one of the most powerful things I have ever done for my health. Yes, I wanted to lose weight, and I did. 15 lbs! I already knew my body was overwhelmed with toxicity. That was my real motivation for doing it. I have been struggling with debilitating headaches all my adult life. I contracted Epstein-Barr over 10 years ago and have never been the same. I’ve needed caffeine to just function each day. I eat well and exercise yet, until now, could never lose weight. The program is so well thought out and research-based. There are difficult days. There’s an emotional component that I was not expecting. But it is very doable. You are never hungry. Your body is getting everything it needs to function optimally with nothing else to get in the way. The full support program was so helpful in letting me know that what I was experiencing was normal, and a sign that it was working. My body was healing. The expert calls were a wealth of information. I did Level 1, with some aspects of level 2. After the first week the detox reactions were minimal and very manageable. I have not had a headache since the start of week 2. I have had no caffeine since the start, and have plenty of energy for my day. Bloating in my gut is gone and I can even tolerate gluten a little better. I feel like I have turned back the clock to my early 30s! As I resume “normal” eating again, I still don’t want to stray far from the program. I feel too good to go back! Sleeping Better, More Energy, and Lost 17 lbs! I LOVED this program and lost 17 pounds! I have been telling EVERYBODY about it. I’ve previously done a couple of 3-day juice fasts and a 7-day juice fast. A straight juice fast is not easy; this program was EASY in my opinion, AND I was able to complete the full 26 days. It has totally removed my cravings/addictions. I’ve had malignant melanoma a couple of times (stage l and then stage 3) and am determined to not be a statistic, which would mean that I only have 2 or 3 more years of life. I really feel that God has led me to GSG, and through her He is showing me how we were intended to eat—and how I personally can live a long life! During the first couple of days I had a low-grade headache and some bloating. For the rest of phase l and phase 2, I started feeling pretty good. Rarely did I ever feel hungry—had just a slight hunger at the end of the work day before I got home. By the time I was into phase III for a couple of days, my energy was beyond anything I have ever experienced! Certainly an incentive to continue eating healthfully. Two of my favorite menu items are the Hot Pink Breakfast Smoothie and the Black & Green Salad. The “No Fuss Pit Paste” ROCKS! Ever since my last cancer treatment, I have not found an aluminum-free deodorant that would work; pit paste works better than any deodorant that I have ever used. Love it! I am sleeping better, I don’t feel fatigued from my daily activities/job anymore, I don’t want to sit and watch TV in the evenings or Sat/Sun mornings like I used to, I’m spending more time walking my dogs, cleaning house, or getting little projects done that I have been putting on the back burner, and my body seems to handle hot summer days better too. Lastly, I’m wearing clothes that I haven’t been able to wear in 2-1/2 years! THANK YOU, Robyn Openshaw! I appreciate you and your great staff more than I can express!!! Clearer, Softer Skin, More Energy, Lost 10 lbs—EVERYONE Should Do This! I would totally recommend to others! I have clearer skin and softer skin, my hubby noticed that right away. Skin issues on my elbows are gone completely! I also am putting coconut oil every night on skin spots and doTERRA Clear Skin. Rotating them and it’s working great. No more expensive prescription creams and lotions. No nausea or upset stomach. No gurgling stomach or pains. Food tastes better and more enjoyable. Never thought I would love a sweet potato/or even regular one with only Flax Oil and green onion/chives. Delish! It’s fun to just eat food now to see what it REALLY tastes like without salt, butter, etc. Hair is growing super fast and my nails are hard for the first time in a long time. Joint pain almost gone except for one shoulder, but again, only a matter of time eating like this and it will be gone too. Passed gallstones and sludge during oil therapy. And menstrual cycle so much easier, less cramps and NO cravings (still don’t have cravings for junk which is still shocking to me) and PMS was lighter and easier. I did it for immune reasons for skin and Lyme toxins, but a perk was losing approx 10 pounds. Energy coming back to take longer walk/hikes with no pain or struggling to breathe! I also feel happier and have a better outlook on my health. I finally have hope and actually believe things are going to get better and better, something no doctor in 8 years could do for me, but green smoothies and detox foods did!!! EVERYONE should do this! A Flat Stomach in Mid-Life, 10 lbs. Lost! I liked how well researched and clinical the detox was. It felt safe and empowering to challenge myself, and I ended up losing 10 pounds! I am maintaining that after the detox with the same types of foods and continuing to lose even the next week, too! There is nothing better than to have a flat stomach in mid-life again! Fell in LOVE with the detox! Why did I fall in love with the detox? First, it was easy. Most of it was delicious. It was so well organized (a million thanks for all that effort!) I learned a lot and learned a lot about my body. I feel connected to it now. I lost weight (thank you!) and I made it the entire 26 days. There were days I thought I might cave in but I didn't. So when the night of the 26th day came, I held out, I didn't cheat! I was encouraged to "go ahead" but I refused! I want to do it again. It was such a rush of excitement for each passing day; to understand why I was doing what I was doing and all the great daily videos and emails. Wow, wow, WOW! I keep hearing people say that they want to detox. They want to know what I did. I tell them GSG but don't share the book. They want it! But I hold to my guns. I paid a nice amount for that book, I'm not giving it up so easy! LOL. 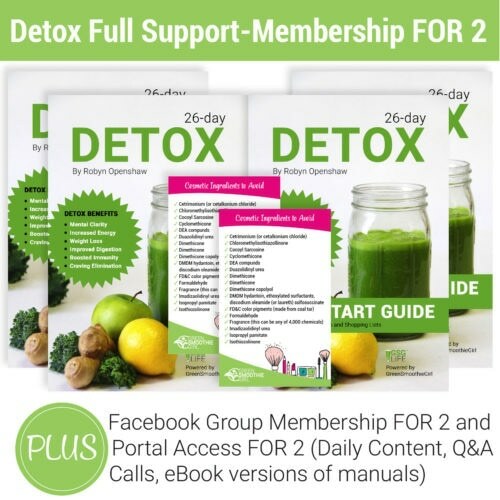 But, as an Integrative Health Coach (or soon to be) I have never detoxed before and I couldn't have been more pleased with my choice to choose GSG as the first detox ever. And it will be my only detox ever. I love what you are all doing. Robyn is extraordinary, I just love her. I feel like she's talking only to me when I listen. So yes, I'm hooked on all things GSG! Purchase your detox and join me in our journey toward health and wellness! Have you seen my FREE Video Mini Masterclass series? 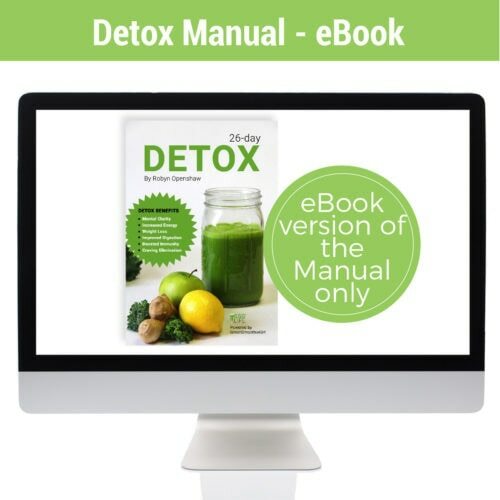 I go in-depth about the benefits of detoxification. Click for exclusive access!